Anna Wells: Home for the Holidays Hop! CONGRATULATIONS TO JENNY BRIGHTMAN WINNER OF THE AMAZON GIFT CERTIFICATE! Divide dough in half; shape into discs. Wrap each in plastic wrap; refrigerate for 1 hour. (Make-ahead: Refrigerate for up to 24 hours.) Let stand at room temperature until soft enough to roll out, about 15 minutes. Cinnamon Sugar: Combine sugar, butter and cinnamon; spread half evenly onto rectangle. Starting at long side, roll up dough. Wrap in plastic wrap and refrigerate until firm, about 30 minutes. Repeat with remaining dough and filling. Cut rolls into 1/4-inch (5 mm) thick slices; place, cut side down and1 inch (2.5 cm) apart, on parchment paper–lined or greased baking sheets. Cream Cheese Glaze: Combine cream cheese, icing sugar and milk; drizzle over cooled cookies. “Wow! You look good enough to eat!” Michaela declared as she opened her front door, eying the handsome tuxedoed man standing before her. Jordan Marsh was hot with his thick, wavy, dark blond hair, and sculpted features. And, God, let’s not forget that lean, fit body. He was the kind of man that women fantasized about, unfortunately the two of them were just friends. “Well, if you insist. Go right ahead. I’m certainly not going to stop you.” Jordan casually leaned his broad shoulder against the doorframe as he tilted his dark blonde head to the side in his usual cocky manner. “I might add you look pretty hot yourself tonight,” he said, his blue eyes sparkling as he appraised her figure with obvious appreciation. “Nice… You look great in that red dress. Now turn around so I can get the whole picture.” Michaela did as he asked and Jordan nodded in obvious appreciation. “Of course I do it’s too much fun not to.” Flashing a pleased grin at what he obviously thought was a clever response. “I think you need another hobby besides making fun of me,” Michaela informed him, enjoying the easy banter they always shared. Jordan took the wrap from her hands and placed it on her shoulders, his hands lingering a little more than necessary. He moved his hands up and down her arms lightly before he released her. Michaela felt a shiver go down her spine at his touch while she breathed in the scent of his spicy cologne. What was that about she wondered? Jordan is just a friend, nothing more she reminded herself. Although it wasn’t the first time she had been forced to issue that particular reminder. “You know me, free food, free drinks, I’m there,” he said easily as he escorted her out the door with a firm touch on her lower back. Jordan gently grabbed her hand and guided her down the steps beside him. “No way, Michaela, I am not letting you get away with that. Let’s get this straight. I am doing you the favor which means you owe me.” When they reached the sidewalk, he raised his free hand to hail a cab. “Does everything have to be a competition with you?” she asked in exasperation while wondering when they had begun this hand holding thing. It wasn’t that she was old fashioned, there were just some invisible lines that weren’t crossed when you were just friends. Hand holding was definitely crossing one of those lines, she was sure of it. She tried to ignore the way he was rubbing the inside of her palm with his thumb. It felt so intimate that it made her body shiver. “Michaela everything is a competition,” he told her as a taxi pulled up to the curb, and then he casually helped her into the cab. Michaela shifted on the seat making room for his large frame. “Even between friends?” she asked. “Especially between friends,” he assured her. Oh I can't wait to try out this cookie recipe and the book Relentless. Thanks for the giveaway! what a great recipt for the holidays! Can't wait to make them!!! Cookies are my weakness, especially around the holidays! These look great! What a great sounding recipe, very different, from what I usually make. All these wonderful recipes! When will I find time to read if I'm in the kitchen all day and night? I love the premise of two wronged lovers getting together. It suits the season perfectly. Awesome giveaway!!! Thanks so much!! Oh a cookie and cinnabun omg yes i want those lol... Thanks for being part of the hop. I have never heard of these cookies O.O def going on my list to make, that is truly growing on this wonderful hop :D Big Hugs I followed by email, twitter & fb. Thanks for sharing the recipe-it sounds sweet and delicious. Looks yummy. Thanks for a great post and awesome giveaway!!!!! I'm going to try these cookies! I printed out this recipe and it is going to be added to my Christmas cookie baking. I saved the recipe. I'm always looking for different dessert recipes and with those you can put them in a container and they should last a little while, I hope. I was already signed up to your newsletter and everything so I didn't have to repeat the process. Thank you for the recipe and for your involvement with the giveaway. The world needs more people like all of you in it. It's a kind and thoughtful gesture of what you're all doing. 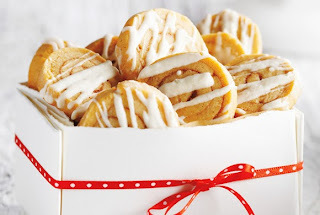 Cinnamon roll cookies, two of my favorite things in one! I'll have to give these a try. Thanks for the recipe and excerpt! Hi! Im loving all these recipes! Those cinnamon roll cookies look amazing! Theyll definitely be a big hit with my family! Thank you for sharing and for the giveaway!! Happy Thanksgiving! Oh my gosh, those cookies sound great!